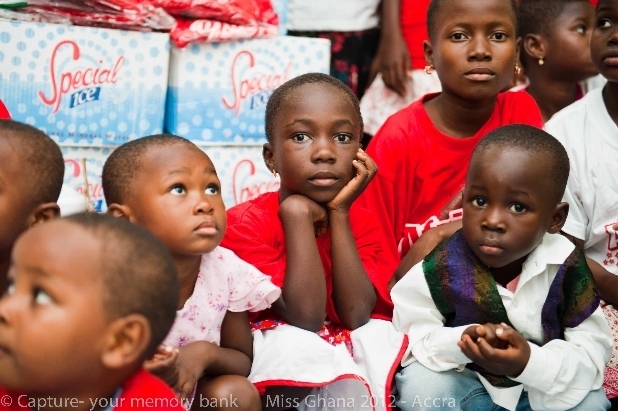 A team of Miss Ghana officials have donated items worth thousands of Ghana cedis to the Remar Orphanage in Dansoman, Accra. The donation, which took place weeks ago shortly after the Accra auditions, formed part of the direction of this year’s pageant to ensure that as many lives get to be touched in a positive way, using the platform that the brand offers as a catalyst for social growth. Officials of the facility thanked the Miss Ghana team, which included CEO Inna Mariam Patty, Contestant Manageress Laureta Aryeetey and all 8 finalists from Southern Belt (Accra) for their kind gesture, promising to put the items presented to them, to good use. Powered by Exclusive Events Ghana, the Miss Ghana event continues to offer hope to millions of households including the young and intelligent ladies who take part every year. This year’s edition has lived up to the hype, and has brought a whole new dimension into the organization of beauty pageants in Ghana and the sub region at large. Twenty beautiful and witty young ladies will compete for the coveted prize of Miss Ghana 2012 at the national finals in Accra. GOD BLESS THE ORGANIZERS AND MEMBERS OF THE MISS GHANA 2012 TEAM FOR SUCH A WONDERFUL WORK. I AM SO TOUCHED AND FEEL SO HAPPY AT THIS DONATION. THE CHILDREN WILL FOREVER REMEMBER THIS DAY!